My mom and sister both have June birthdays. 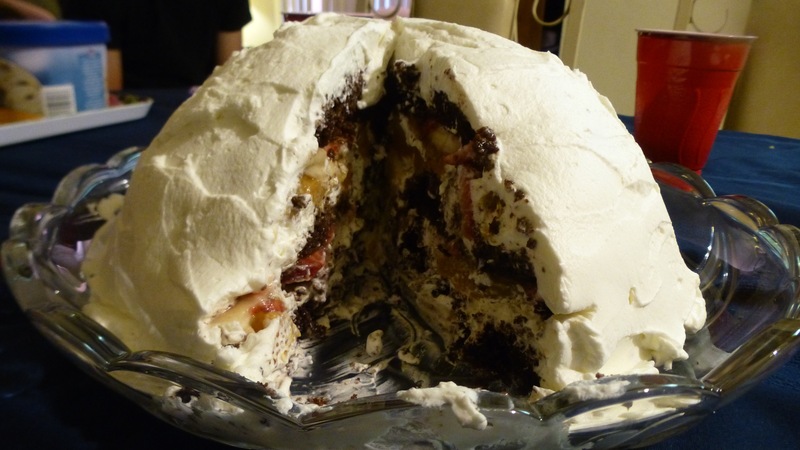 We gather as a family to celebrate and every year they request this bombe cake, layers of chocolate cake with strawberries, bananas, peaches, and whipped cream. The original recipe came from my cousin Rosalie. I like to use a homemade chocolate cake but you can use a box mix if you are pressed for time. It is optional to use vanilla pound cake and flavor the cream with cocoa powder as well. You could also try a lemon cake with a bit of mascarpone added into the whipped cream and mixed berries. 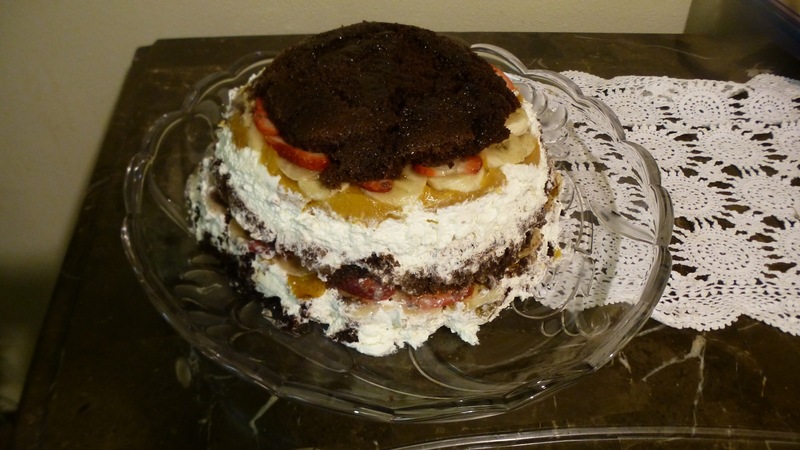 There are several steps to the recipe; the chocolate cake can be made a day in advance, then assembled with fruit and cream. Chill the cake overnight so the flavors have time to mature before you invert and frost with more whipped cream. Preheat oven to 350 degrees. Spray a jelly roll-size pan and line with parchment. In a saucepan combine butter, water, cocoa powder, and salt. Whisk on medium heat until butter is melted and you have a syrupy chocolate mixture. It should take about 7 minutes. In a large bowl whisk together flour, sugar, and cinnamon. Pour the melted chocolate mixture into the dry ingredients and whisk until smooth. Add eggs, buttermilk, baking soda, and vanilla. Mix well. Pour cake batter into prepared pan. Spread evenly to the edges with a spatula. Bake for 15-20 minutes or until an inserted toothpick comes out clean. Cool on rack. Grease a 12-cup sloping bowl or soufflé dish. The amount of cake and fruit used will depend on the size of the bowl. Slice two (1-inch wide) pieces of cake to line the bottom of the bowl. Place a layer of sliced strawberries on top of the cake. Place a layer of sliced bananas over the strawberries, then a layer of sliced peaches over the bananas. Whip 2 cups of the heavy cream with 1/2 of the confectioners sugar and 1 teaspoon of vanilla until stiff peaks form. Spread a generous amount of whipped cream over the fruit. Make a second layer of cake using 3-4 (1-inch wide) strips of chocolate cake, enough to cover the whipped cream. Add a layer of sliced strawberries, a layer of sliced bananas and a layer of sliced peaches. Top fruit with a generous amount of whipped cream. (You may have some extra strawberries and cream to save for another use.) The final layer is strips of cake to cover the cream. 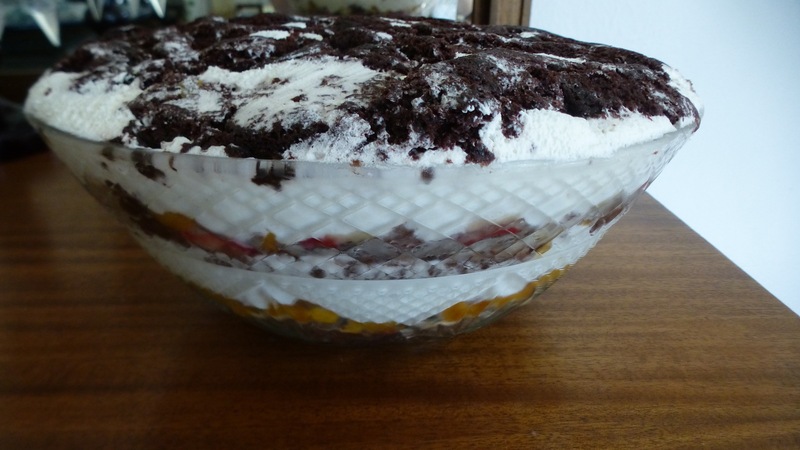 The layers should be as follows: cake-fruit-cream, cake-fruit-cream, cake. Cover cake with plastic wrap and place a plate on top to weigh it down. Chill overnight. When ready to serve, whip remaining 2 cups of cream with remaining confectioners sugar and vanilla to soft peaks. Run a knife around the cake to loosen it. Invert cake onto a platter. Frost with whipped cream. Serves 12. This entry was posted in Cakes, Chocolate, Christmas, Desserts, Easter, Fruit, Thanksgiving. Bookmark the permalink. Wow that looks so rich! This recipe looks fabulous! Hope I can pull it off for Father’s Day! Thank you. I’m sure you can make this. Call me if you need help.